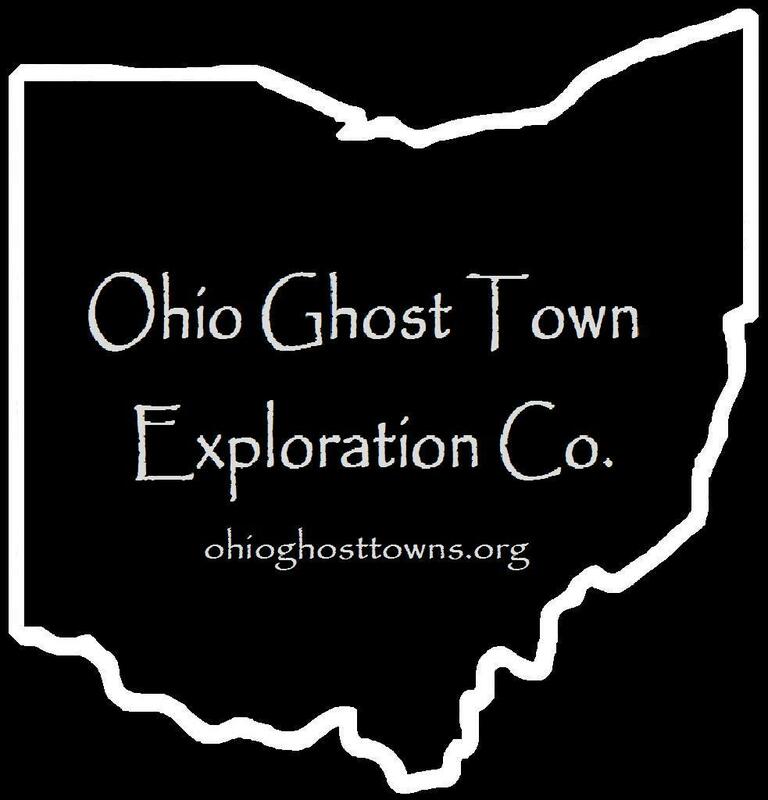 Putnam County – Ohio Ghost Town Exploration Co. Description: The town was along the Northern Ohio Railway & was founded by a branch of the Basinger family. There are no tracks left from the railroad, but its path can be seen on satellite maps north of the GPS coordinates. Most of the residents, including many members of the Basinger family, were buried in the cemeteries in Pandora. Description: The original proprietors were George Clevenger (1808 – 1888) & Elizabeth (Sarber) Clevenger (1809 – 1897). They were farmers, settled in Union Township in 1830, & had a few children. George was elected as a township supervisor in 1835. The town had a school on the east side of SR 115 south of the GPS coordinates on land owned by Jacob Blosser (1830 – 1892) from York County, Pennsylvania & Sophronia (Sietz) Blosser (1833 – 1933) from Fairfield County. Most residents, including the Clevengers & Blossers, were members of the Thompson Primitive Baptist Church at the intersection of SR 115 & Rd P (County Hwy P) 2 miles south of Clevenger Cemetery. The congregation was formed in 1869 & the current church was constructed in 1894. Everyone mentioned in this listing was buried in Clevenger Cemetery. Description: William Cochran Jr. was appointed to the county sheriff position in 1834 & was the town’s postmaster. Description: Henry Miller was the postmaster. Description: The town was founded by the Dukes family who arrived from Franklin County in the 1830s & the first post office was called Dukes from 1837 – 1851. There was a church on the north side of SR 12 near the GPS coordinates & a town hall on the south side of SR 12 across from the church. George W. Dukes (1830 – 1907) was the postmaster when the office was called Stanley from 1863 – 1891. The town name also changed to Webster sometime during that time period. It was never platted, last spotted in the 1880 county atlas, & didn’t make it into the 1895 county atlas. George W. Dukes was buried with relatives in Maple Grove Cemetery 13 miles northeast of the GPS coordinates on the north side of SR 12 (W Main Cross St) in Findlay. Dukes Cemetery is 8 miles northeast of the GPS coordinates on the south side of US 224 between Township Rd 120 & Township Rd 123 in Blanchard Township, Hancock County. Descendants of the Duke family still live along Duke Run in the vicinity of the former town & continue their historical tradition in the local farming industry. Description: Amos Kendall platted Franconia in 1837. It had a tavern operated by Pearson Holden (1802 – 1867) who was also the first postmaster, a general store originally owned by Parlee Carlin (1805 – 1883), & was a busy trading point for early settlers. Peter Myers (1800 – 1879) was the last postmaster. The town faded out of existence well before publication of the 1880 county history book. Pearson was buried with relatives in Holden Cemetery 3 & 1/2 south of the GPS coordinates on the southwest side of Rd 22K. Parlee was buried with relatives in Maple Grove Cemetery on SR 12 (W Main Cross St) in Findlay. Peter was buried with residents & relatives in Franconia Cemetery. Description: It was platted with 22 lots in 1888 by Samuel Stuckey (1846 – 1934) from Fairfield County & had a train station on the Toledo, Delphos, & Burlington Railroad (later reorganized as the Toledo, St. Louis, & Kansas City Railway). Samuel was a justice of the peace, operated a general store, & was the town’s first postmaster. He married Rebecca (Wildermuth) Stuckey (1852 – 1920) in 1876 & had one daughter. They later moved to Franklin County & were buried in Obetz Cemetery on Groveport Rd on the southeast side of Columbus. Huntstown also had a school along the railroad tracks south of the GPS coordinates on land owned by the Hitchcock family. It was once a promising farming town, but lost the local business competition to Cloverdale, platted just a mile to the north in 1877. Description: It was along the Columbus & Lake Michigan Railroad. Description: This small farming town was mentioned in the first edition of Henry Howe’s “Historical Collections Of Ohio” as he passed through Putnam County in 1846. Description: The town was on the Cincinnati, Hamilton, & Dayton Railroad & had a saw mill & lumber yard owned by Daniel Kelley (1856 – 1926) & Idella (Compton) Kelley (1866 – 1948) west of the railroad tracks on the south side of Rd C. There was a school in the northwest corner of the intersection of Rd C & R5 on land owned by German immigrants John Dehnart (1823 – 1891) & Catherine Dehnart (1831 – 1883). Everyone mentioned in this listing was buried with relatives in Sugar Ridge Cemetery 3 & 1/2 miles south of the GPS coordinates on the north side of SR 613 (E Main St) west of County Hwy 5 (Protec Pkwy). Description: Philip S. Carr was the postmaster. Description: This small farming & postal town fell off of maps as Leipsic grew. E. H. Alward was the postmaster. The former church on the north side of SR 613 has an unusual looking block construction. Many township & county pioneers were buried in the extensive cemetery grounds around the area. Description: This Ottawa Native American town was in existence for several decades up to the early-1830s. Description: Wards was a small farming town on the New York, Chicago, & St. Louis Railroad (Nickel Plate Road) in the late-1800s to early-1900s.